If you are a chronic back pain sufferer, you are not alone! It’s a leading cause of disability worldwide. The good news is that in most cases therapeutic yoga can help decrease pain and protect your back from further injury. Studies have shown that yoga can offer powerful benefits for back pain relief. How does yoga work? In my experience, the following 4 keys can help to enhance the benefits of yoga when working with back pain. Yoga is both a science and an art. Although not a panacea, it does offer relief, self-empowerment, and even healing for those individuals who are fortunate enough to find a good yoga teacher, especially one who specializes in yoga for back pain. One of yoga’s greatest gifts is the way the practice slows us down and helps us to be in touch with what’s going on inside. Through the practice of yoga, we develop a fundamental attitude for healing, that of Ahimsa—non-violence or kindness. When we extend our limbs in a pose, we meet the resistance of our stiff muscles. In the beginning, we judge all pain as negative, fearing we may re-injure ourselves. However, all sensations of discomfort are not negative. Meeting the resistance within us, physically and mentally, is the doorway to releasing our healing potential. Body mechanics and proper alignment play important roles in healing back pain. Regardless of the cause, some muscles are short, tight, or even in spasm. Others may be long, weak, or overworked. As we correct these imbalances with an appropriate yoga sequence, we are correcting and re-aligning our posture. As students learn and maintain proper alignment, joint stresses are released, muscles and fascia appropriately stretched and toned, and body mechanics become more efficient. 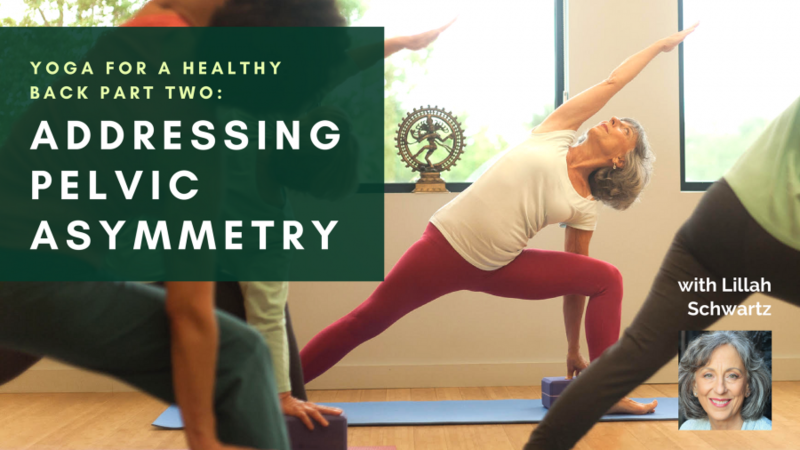 The risk of re-injury is reduced as we create a balance of strength and flexibility, making alignment an essential part of the healing process. The art of yoga also guides us to focus on the breath in order to build the bridge between body, mind, and soul. When we look within and breathe deeply in a pose, we begin to reverse the stress cycle. Our body gets the message that it is “safe” to relax. The muscle fibers release, blood vessels dilate, endorphins release, and stress hormones decrease. As a result, even the simplest of poses can have a profound effect on relieving the aches and pains associated with back pain and stress. In relation to back pain from a disease process, yoga offers sublime and unexpected relief. One of the cornerstones of Iyengar yoga, the style in which I have trained, is the adaptability of poses through the use of props to maximize the asanas’ therapeutic benefits. The therapeutic aim in this instance is measured not in a structural way, but rather in relation to the organic body and its function. The poses are done in such a manner as to open and stimulate the core of the body, thus improving circulation, elimination, and overall healthy functioning. A well-guided yoga practice will support a higher level of physiological function and its own resulting sense of well-being. According to Mr. Iyengar’s method, the practice of yoga is an integrative art, often moving students toward longer lasting pain relief, renewed self-confidence, and a sense of wholeness. The following three stretches are among my favorites. Many students report that they offer a simple way to gain relief from low back pain. Practice each one individually, or all three together. Hold each pose for 5 breaths. Position: Bend forward at your hip joint and extend your arms, placing your hands on a wall, desk, or chair. Choose an appropriate height so you align the wrist, shoulders, and hips. Step your feet hip-width apart and toe in slightly. Action: Turn the upper arms out so the shoulder blades move away from the spine. As you exhale, move your pubic bone and top thighs back and lift your sits bones. Extend your spine completely, pressing your palms into the wall. Feel the stretch of the legs and ribs. Position: From a kneeling position, spread your knees as wide as they will go, keeping the big toes touching. Place your elbows on the floor under your shoulders. Keep the hips even with your knees, the lower back slightly concave, and the belly soft. Action: Breathe deeply, let go of tension in your neck and spine, and then move the hips slightly forward and back to extend the inner leg. Position: Lie on your back, knees bent, feet on the floor—yet wider than your hips—arms out to the side. Action: Drop both knees to the right, tuck your tailbone, exhale, and lift the bottom of your belly in and up as you draw your hips and waist back toward the floor. Feel the stretch through the front of your thighs and hips. For back pain relief, look for an experienced yoga teacher who has training in alignment and body mechanics, can adapt poses for persons with a limited range of motion, and understands the function of pain and mental attitude in the practice of yoga. Yoga is a wonderful practice for back pain sufferers, allowing us to tune in and release pain in a positive way; teaching us proper alignment to relieve strain and re-balance our posture; helping us to use our breath to release stress, build self-confidence, and improve our overall health and well-being. Study with Lillah Schwartz and YogaUOnline - Yoga For a Healthy Back: Addressing Pelvic Asymmetry. 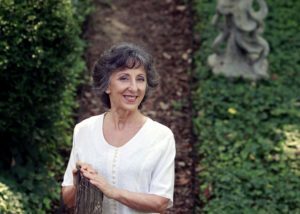 Lillah Schwartz, C-IAYT Certified Yoga Therapist, is an Asheville-based yoga teacher, teacher trainer, and author with more than 35 years of experience. A certified yoga therapist, her specialties include her book, Healing Our Backs with Yoga: An Essential Guide to Back Pain Relief which came out in 2016. Lillah also has 3 therapeutic yoga DVDs for back pain relief.